Micro-blogging platform Twitter became one of the biggest online websites to know the details and all the other information about the General Election 2019 which started yesterday. On April 11, the first day of the General Election 2019 of India began and Twitter took to its platform to announce that more than 45.6 million tweets related to the elections were tweeted. And currently the #LokSabhaElections2019 hashtag is trending and it is likely to trend time and again till the end of the elections. It should be noted that on Thursday, April 11, polling started for 91 seats in 18 states and 2 union territories in India. 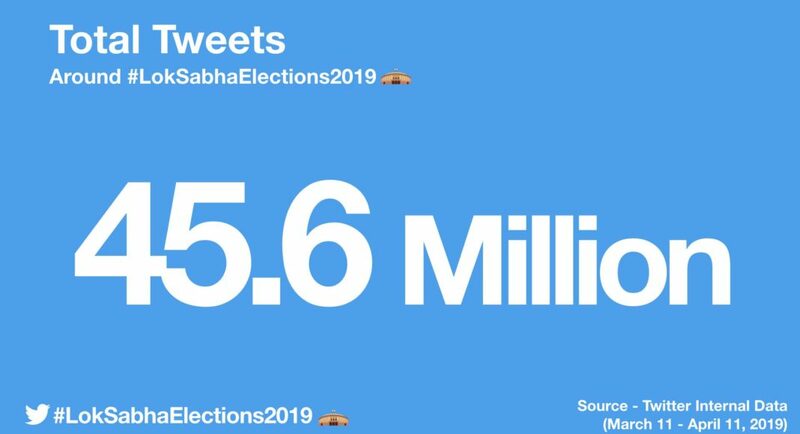 According to Twitter, it recorded 45.6 million tweets related to the Lok Sabha Elections 2019 from March 11, 2019 till April 11, 2019. And on the day of elections, Twitter recorded more than 1.2 million users tweeting about the phase one of the Lok Sabha Elections 2019. Twitter has always been one of the most-used platforms by politicians, political parties to get their words to the people and vice versa. Recently, both the parties Congress and Bhartiya Janta Party (BJP) had posted their manifestos on the platform for the people to see. And they also went on to become some of the top-tweeted moments of the platform. Other than the politicians, political parties and the citizens of the country are also known to use the platform to ask questions, enquire and express their opinion over a number of things. Currently, most people in India are talking about elections in India. Also, according to Twitter, the Indian Prime Minister Narendra Modi (@narendramodi) has become the most mentioned figure during the first phase of the Lok Sabha Elections 2019 on Twitter. Not just Indians, but also NRIs across the world are taking to Twitter to engage in dynamic conversations cantered around the ongoing General Elections in India. People are retweeting, using hashtags, comments and replying to discuss the topics and the subjects which matter the most to them. So, Twitter has become one of the biggest platforms during the elections. Earlier, weeks before the Elections started, the Election Commission of India (ECI) had joined Twitter to let the users and the people know about the ‘know-hows’ of the Lok Sabha Elections 2019. Earlier, in March 2019, national security was one of the most talked about election-related topic on Twitter. With the end of the first phase of the elections and several more to go, Twitter India and the platform itself is encouraging people and users of the platform to do their part and cast their votes. Twitter is also giving a national platform for the citizens of the country to say their thoughts and express their opinions. Users of the platform can join the conversations by following the #PowerOf18 and @TwitterIndia and express their opinions. Recently, Twitter released a video in the #PowerOf18 series to encourage the young Indians to participate in the civic discourse and understand the importance of their votes and contribute to the public debate on Twitter.